Photograph collection of webmaster. On a damp November 10th 1979 25132 passes through Patricroft with a parcels train. The eighteen year five month career of D5282/25132 saw allocations only to London Midland Region depots. Boiler room grills sheeted over (1977). Time between withdrawal & scrapping: 23 months. August 1964 to Nottingham (16D). September 1967 to London Midland (Midland) Lines. 25132 was the 162nd Class 25 withdrawn, one of eight withdrawn during December 1983, including 25130, 25131, 25132 & 25134. 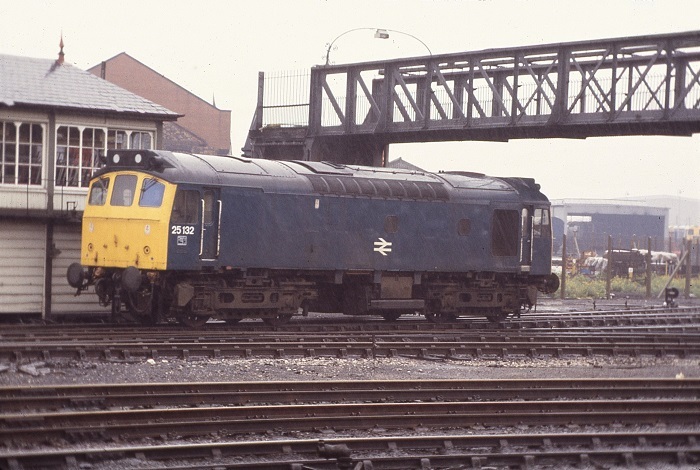 After withdrawal 25132 was stored at Crewe from January 1983 until March 29th 1984 when 25132/135/136/143 were was moved to Gloucester, reaching Swindon Works by April 2nd 1984. It was scrapped at Swindon Works by the middle of November 1984. Noted Crewe Works January 1970. Noted Derby Works November & December 1977. D5282 was delivered to Toton during July 1964, having made its Corby test run on June 18th. During August D5282 was transferred to Nottingham (16D). On August 13th the 08.36 Nottingham - Llandudno Town and the return Llandudno Town - Nottingham were worked by D5282 & D7546. The Liverpool Division received D5280 - D5282 during July, whilst in November 5280 - 5283 were transferred to the Preston Division, 5282 would remain here for three and a half years. 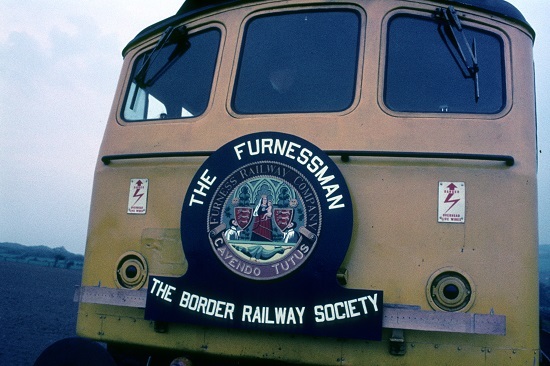 On May 24th the Border Railway Society 'Furnessman' brakevan railtour was worked roundtrip between Carlisle & Barrow by 5282. 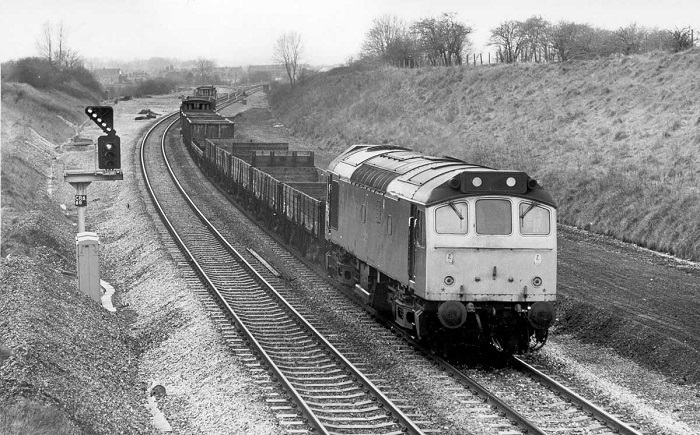 5282 and ten brakevans travelled from Carlisle to Workington Moss Bay where private owner industrial locomotives worked Workington Moss Bay - Harrington Junction - Copperas Hill - Lowca - No.4 Pit Siding - Bain's Siding. The Class 25 then took over the train to Parton - Whitehaven - Corkickle - Moor Row - Rowrah - Moor Row - Egremont - Beckermet - Sellafield - Ravenglass - Millom - Foxfield - Park South Junction - Barrow-in-Furness - St Lukes Junction - Loco Junction - Hindpool North - Devonshire Bridge - Carnforth Yard - Carlisle. Photograph collection of Roger Geach. The headboard carried by Class 25 No.5282 on the brakevan railtour. 5282 was noted under repair at Crewe Works during January. On June 3rd the 08.12 Derby - Norwich was worked by 5282 & 7622. More transfers took place with 5281 - 5286 moving to Springs Branch during July. For some the stay here was not long, 5281 & 5282 moved to Toton during August. On June 29th 25132 & 25210 worked the 08.52 Leicester - Skegness and the 12.30 Skegness - Leicester. Just over a month later on August 3rd 25132 & 25081 worked a roundtrip Derby - Skegness service. The 14.15 Yarmouth - Derby from Norwich was worked by 25132 & 25124 on September 7th. On July 21st a roundtrip Derby - Skegness was worked by 25132 & 25038. This pair were still together on July 26th when they worked the Derby - Norwich - Yarmouth - Norwich - Walsall diagram. The Derby - Norwich - Yarmouth - Norwich - Walsall diagram was handled by 25132 & 25074 on September 13th. Twenty wagons in a Tutbury – Tring freight derailed near Leighton Buzzard on April 8th. The locomotives, 25124 & 25132 remained on the track, a broken spring being blamed for the derailment. On July 31st a Leicester - Skegness roundtrip was worked by 25132 & 25127. On September 18th the Derby - Norwich - Yarmouth - Norwich - Walsall diagram was worked by 25132 & 25136. On June 28th 25132 worked the 15.10 Cardiff - Crewe. 25132 & 25118 had a busy week in mid July working four round trips to Skegness, from Derby on 11th, 12th & 14th and from Leicester on 13th, but the return leg ended at Nottingham. Derby Works was busy repairing 25132 during November & December. Its high summer in Derby and today (July 30th) its the liquid kind. In the midst of a particularly heavy downpour 25132 drops down onto the fuelling point. With weather like this it was not surprising that when visiting the Works the corrosion repair of the Class 25 bodies was significant. 25132 & 25147 had a busy period in mid August working the 08.00 Walsall - Yarmouth to Norwich and the return 14.15 Yarmouth - Derby from Norwich on August 12th, and roundtrip Leicester - Skegness services on 13th, 14th & 15th. On September 2nd 25132 & 25123 worked the 08.00 Walsall - Yarmouth to Norwich returning with the 14.15 Yarmouth - Derby from Norwich. The next day (3rd) the same pair worked the 08.40 Leicester - Skegness and the return 18.30 Skegness - Leicester as far as Nottingham, where both Class 25s were removed after 25132 failed. On July 4th 25132 & 25293 worked a roundtrip Nottingham - Skegness relief. On July 21st 25132 & 25124 worked the 08.00 Walsall - Yarmouth to Norwich, returning with the 14.15 Yarmouth - Derby from Norwich. The same locomotives worked roundtrips to Skegness from Leicester on July 22nd and Nottingham on July 25th & 26th (both reliefs). Early August was very busy for 25132 & 25124, on August 4th working the 08.00 Walsall - Yarmouth to Norwich and the return 14.15 Yarmouth - Derby from Norwich. The same locomotives worked roundtrip Leicester - Skegness services on August 7th, 8th & 9th. By August 11th 25132 was now paired with 25123 and worked the 08.00 Walsall - Yarmouth to Norwich, returning with the 14.15 Yarmouth - Derby from Norwich. Two roundtrips to Skegness followed, from Leicester (12th) and Derby (15th). On September 13th the 18.32 Norwich - Birmingham New Street was noted behind 25132, (presumably worked throughout?). December 15th found 25132 moving snowploughs around the March area, taking a plough from March to Norwich, before running light to Ipswich to collect the plough for Cambridge. As there was no brake van available at Ipswich the trip was cancelled and the Class 25 returned light to March! The 15.15 Plymouth - Manchester Piccadilly on January 2nd was worked by 25132 between Gloucester & Birmingham New Street. On July 12th the 08.02 Walsall - Yarmouth to Norwich and the return 14.30 Yarmouth - Walsall from Norwich were worked by 25132 & 25125 (not the normal diagram for the locomotives). The following week (20th) the same locomotives worked the return leg of a Barry Town - Stalybridge day excursion from ?? On September 6th the 0802 Walsall - Yarmouth to Norwich and the return 14.15 Yarmouth - Derby from Norwich were worked by 25132 & 25125. A week later (13th) the 04.10 Shrewsbury - Aberystwyth and the 10.07 Aberystwyth - Euston to Wolverhampton were worked by 25132 & 25123. During April 25132 was transferred to Longsight, this would be its final transfer. Photograph courtesy J Davenport. 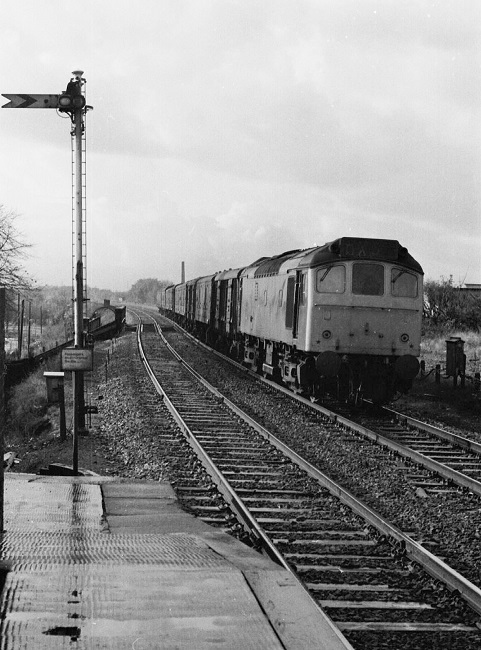 25132 makes a fine sight at Saltham Junction on April 11th 1982 in charge of what appears to be an empty goods train. For some period during the ASLEF strike (July 4th - 18th) 25132 was stabled at Severn Tunnel Junction. On July 24th the 07.40 Euston - Aberystwyth from Wolverhampton and the 14.00 Aberystwyth - Shrewsbury were worked by 25132 & 25062. The 12.50 Carlisle - Glasgow Central was worked by 25132 on August 9th & 13th. On December 13th 25132 was noted headed eastbound through Manchester Victoria with a lengthy train of parcels vehicles. On December 20th 25132 was withdrawn whilst at Crewe, it sisters 25130 & 25131 had been withdrawn earlier in the month on December 6th. A builders plate from 25132 sold at Great Central Railwayana Auctions for £280 during June 2015. Page updated January 15th 2019.